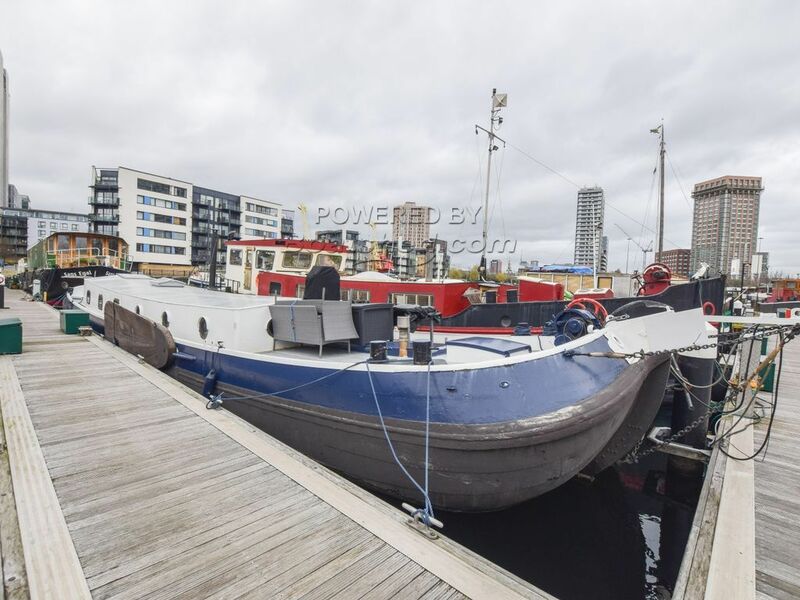 Boatshed London are delighted to offer this 22m Dutch Barge Tjalk for sale with London residential mooring. Built in 1909, this fantastic houseboat has been recently renovated entirely inside and out to create a beautiful floating home for a couple or family. Unlike some other similar barges, this one feels modern and bright with good headroom (2m in the saloon and cabin, reduced to 1.75m in the guest cabin). Large windows and a skylight as well as modern fittings all contribute to the overall feel and this really is a boat that you can move straight onto. The current owners have spent money on every area of the boat. In 2016, she was overplated where required, epoxied and had new anodes fitted. The stern gland and exhaust were also replaced/upgraded in 2016. Entering from the stern into an open plan galley and living area where you'll find the stylish stove. The boat also has diesel central heating. There is a washer/dryer and modern appliances in the galley. The master cabin is large enough for a king size bed with good storage and the bathroom is also a good size. The two massive holding tanks for the loo mean that you only need to pump out four times a year. To the bow, there is the second cabin with another double bed and underneath the foredeck is a huge storage area. The residential mooring at Poplar Dock is fully transferable (5% transfer fee) and is a great location for someone working anywhere in the City or Canary Wharf. Current mooring fees are £14,300 per annum roughly. The marina is a great, little community of boaters and there is a laundry, phone connection for every boat, car park (£600p.a. ), shower block and marina staff onsite every day. This Dutch Barge 22m With London Mooring has been personally photographed and viewed by Angus Rose of Boatshed London. Click here for contact details.